Address by Rt. Wor. Bro. Rabbi Dr Raymond Apple, AO RFD, Past Deputy Grand Master of the United Grand Lodge of New South Wales & the Australian Capital Territory, to the Australian and New Zealand Masonic Delegation, Jerusalem, 8 May, 2014. An edited version of the address appeared in the Australian Jewish News on 23 May, 2014. Some of those who are present tonight have been to Jerusalem on earlier Masonic missions from the Antipodes. For others it is their first time here. These occasions bind the two ends of the world, and I appreciate the privilege of welcoming you in my dual capacity as an Australian-Israeli Freemason. As an Israeli, I welcome the Antipodean visitors like the Temple priests greeting those who came on a festal pilgrimage, and I say Achenu, b’ruchim attem – “Brethren, we bid you welcome!” As an Australian I echo Scripture (I Sam. 25:6) and say to the Israelis, Attah shalom uvet’cha shalom v’chol asher l’cha shalom, “Peace to you, peace to your house, peace to all that you have”. “One of the amazing experiences of this city is how every day – and any day – is both yesterday and today. The street names resonate with memories of ages as disparate as King David and King George. The buildings are a jumble of the Bible, the Koran, the 19th century European Christian missionaries, and the Champs Elysees. The people are mystics and moderns… sometimes rolled into one. There are believers who move sedately, lost in meditation; there are pietists who constantly scurry in search of a chance to study or to pray. There are old women who lug their heavy shopping trolleys, students with back-packs on the way to a lecture, youngsters in skimpy dress who meet their friends in an underground disco or bar. All believe that Jerusalem belongs to them. 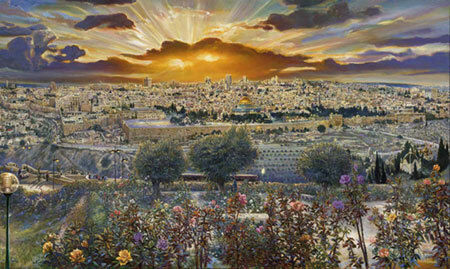 “Jerusalem is an elevated site, where life is always on a high. There are high-rise apartments, and lowly caves. There are stairs too, and walls. Parts of the city have the feel of Wall Street – but the wall par excellence is the Kotel Ma’aravi, the Temple’s Western Wall that has survived the depredations of generations of the city’s conquerors. “What happens at that Wall depends on who you are. To some there is sheer holiness in the air; to some it is where you excitedly encounter tour groups from all over the world; to others it is a bothersome gathering of mendicants. The attempts to clear the beggars away have not entirely succeeded: a few hardy suppliants have been seeking donations to pay for their daughter’s wedding for so long that you recall Gilbert and Sullivan’s verse, ‘She may very well pass for forty-three in the dusk with a light behind her’. The past and the present jostle in Jerusalem. Some things stay the same. Nooks and crannies, and even some of the people, are truly almost as ancient as they seem. But change is also in the Jerusalem air. The skyline is changing. So is the streetscape. Every time you come here, a new building is rising. Cranes aim for the heavens, bulldozers clear the corners, cement-mixers prepare great edifices, new suburbs emerge, new apartment blocks, new schools, new places of worship, new shopping malls, new parks and gardens: all are under way. There are old-new tensions too: groups mixing or not mixing, views frenziedly debated, easy or uneasy compromises – that’s Jerusalem. There is a magic about the name Jerusalem. People who have never been here dream of it and whisper that one day they’d like to make a visit. You, our visitors of tonight, are actually fulfilling that dream. Those who are Jewish feel like offering a Shehecheyanu: “Blessed are You, O Lord, Who has kept us in life, preserved us and enabled us to reach this moment”. What a high to be on! Yet some visitors feel that it’s a let-down, a disappointment, a disillusionment. I don’t quite know what you expected, but somehow it wasn’t there. Let me try and work out why. Come with me on a journey of memory. I remember the first time I went to Dublin. It wasn’t a disappointment, though I was surprised to see – at least in those days – a pub on every street corner, with a few in between. I remember the first time I went to Oxford – I expected, and found, university colleges everywhere. No disappointment there. The orderliness of London, the impressiveness of Edinburgh, the culture of Prague and Budapest, the music of Vienna, the religion of Rome, the national institutions of Canberra, the beauty of Sydney – they were all more or less what I expected. What about Jerusalem the Holy City? What do people expect? Everyone a Biblical prophet in sandals, brandishing parchments of prophecies? God walking the streets? An aura of idealism, a halo of holiness? The place certainly has amazing vistas of heaven and earth, hundreds of houses of worship, thousands of pietists, a cacophony of cloth and clergy, and the sing-song of study of sacred texts – but looked at as a whole, the strange thing about Jerusalem is how ordinary it is. How can an ordinary city be so extraordinary? How can an extraordinary city be so ordinary? Streets, schools, shops, cinemas, swimming pools, speed humps, television, traffic lights, crazy drivers, mutterings about the weather and the cost of living, all more or less the same as any ordinary city. Yes, additional features of the political situation – security checks, soldiers in uniform, suspicious packages checked on buses and trains: but where is the holiness of the Holy City? It’s a good question, but I want to suggest that it comes from the wrong premises. What is a city, edifices or attitudes? When London was being bombed, it was the spirit of the people that evoked Churchill’s soaring rhetoric and brought the King and Queen down to the East End. What about Jerusalem? Look for the spirit of the people and you find holiness in action. Not everyone is religious in an orthodox fashion, nor is everyone polite. Some children push past you with never an apology (no-one taught them manners), some adults respond to your smile (if they respond at all) with a surly grunt, some believe that queues were invented to be circumvented – but there is a spirit in Jerusalem that combines thoughtfulness of attitude and generosity of action. People struggle to make a living, but they will share their last loaf of bread. People can’t pay the bills, but they will give you the hand of friendship and a blanket to keep you warm. Does this not happen in San Francisco or Sydney, in Auckland or Adelaide? Of course it does, but in Jerusalem it’s an art form. Ask the Author of the Torah about the definition of holiness in the 19th chapter of Leviticus and He will tell you that being holy is being helpful. That chapter doesn’t contain too much about prayers or piety, tabernacles or temples, sacrifices or Scriptures, meditations or mystical raptures, but a great deal about the ordinary dimensions of daily living – how to relate to one another, how to build a family and community, how to handle the people who live in your street, how to speak with the shopkeepers and street-sweepers, how to plan the working week. Yes, Jerusalem has its holy places before which one assumes an attitude of awe. It has its saintly people, whom one sees and faces with reverence. But the general rule of Jerusalem and Judaism is that the place to be holy is not in an ethereal heavenly realm but in the regular way of life in a regular setting among regular people. “Holiness is not so much an abstract or a mystic idea, as a regulative principle in the everyday lives of men and women. The words, ‘You shall be holy’, are the keynote of the whole chapter, and must be read in connection with its various precepts; reverence for parents, consideration for the needy, prompt wages for reasonable hours, honorable dealing, no tale-bearing or malice, love of one’s neighbor and cordiality to the alien, equal justice to rich and poor, just measures and balances – together with abhorrence of everything unclean, irrational, or heathen. The Talmud compares the world to a city. A mighty king tries to destroy it; a modest man succeeds in saving it. Why does the modest man turn out to be more powerful than the mighty king? Not just because of his modesty but his wisdom. He is not puffed up with arrogance but knows how to respond to situations and has an instinct to know what to do. Jerusalem has a long history of difficult moments. What has constantly saved the city is not so much the use of conventional weapons but its people’s spirit: in Talmudic terms, its people’s wisdom. The people of Jerusalem may sometimes be rough-edged as human beings, but they are endowed with a sort of wisdom that carries them onwards and enables them to rise above the difficult moments – their own, and anyone else’s difficult moments. They have an indefinable spirit of family. Within a second they adopt you. Where you come from is not relevant, nor is your creed or colour. Go shopping in Jerusalem, and the checkout clerk will tell us there’s a special on this week and you don’t need to spend so much. When you tell a taxi driver your destination, he’ll tell you it’s better to take a different route. When you sit opposite an English speaker in the bus, you may end up inviting them home for a meal. When you drop coins in a mendicant’s collecting tin (usually a disposable plastic cup), they’ll wish you a good year. When you encounter an ex-Russian engineer singing in the street to make a living, you not only put some coins in their violin case or collecting tin but you sing along with them. When a new family moves in, the whole building will bring them food. Whatever goes wrong – illness, bereavement, a terrorist act, an electric blackout, heavy snow, ice on the roads – everyone else is there to help. Not merely because of good neighbourliness, but because Jerusalem is family. An ordinary city? Not everyone has been brought up with British politeness, but neither are they held back by British reserve. 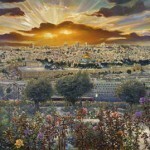 The first time I personally came to Jerusalem was 1958, the tenth anniversary of the State. Jerusalem was still rather like a village. These days it is a metropolis with more than a million inhabitants, but the village hasn’t vanished but is wise enough to re-assert itself and ensure that everyone matters. Every day in Jerusalem I remember that I am a Mason. Not merely because Jerusalem figures in the craft’s ritual, nor because Masonic history is bound up with Jerusalem events, but because in Freemasonry everyone is a Brother. In Jerusalem everyone is your brother or sister. You don’t always agree, but being family is what makes the place and the people holy. So it’s an ordinary city, with the ordinary things that you find in every city. As we have seen, it has its holy sites, its saintly individuals, but most people are not heroes in any other sense than being human and ordinary. What are they? Ordinary good and decent people. They have a spirit of holiness, but it’s a holiness that you see in ordinary relationships. So now comes the puzzle. If this is what makes Jerusalem holy, why then, any city can be holy. Let’s not think of cities in other countries, though we could. Let’s stay in Israel and think of Tel Aviv. Some call it “The city that never sleeps”. Others say simply that it’s “Sin City”. Why doesn’t the world think of Tel Aviv when it uses the name “Holy City”? For that matter, why not Barcelona or Ballarat? The fact is that holiness is latent in every place, person or period. What marks Jerusalem out is not merely history or hypothesis, not merely sacred events or theological doctrine, not merely pilgrims and prayers, piety and poetry, the Temple’s Western Wall, and the light of learning that never goes out. Even amongst the supposed non-believers there is something that urges Jerusalemites to respect, cultivate and express the city’s latent holiness. Could other cities pick themselves up and be holy? They could – if they made up their minds to listen to the quiet small voice. In Jerusalem, when believers give this voice a name and call it God, the non-believers don’t raise a murmur. That, as I see and hear it, is the resonance of Jerusalem. Welcome, and savour the experience.